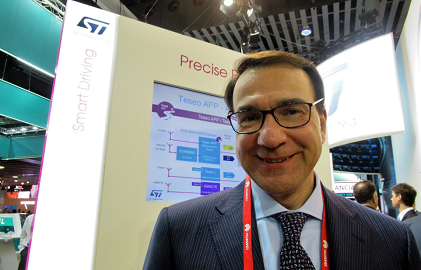 BARCELONA — In the automotive industry’s battle over highly automated vehicle platforms, STMicroelectronics doesn’t get much respect as a head-to-head rival to Nvidia, Intel or Renesas. But underestimating ST’s role in the global automotive market is a risky proposition. Although the company has yet to make formal product announcements, ST has a wealth of technologies up its sleeve for the rapidly changing automotive landscape. They start with a family of powerful MCUs — based on ARM Cortex-R52, six cores — designed for the exponentially growing data flows in the automotive world. ST also boasts its own 360-degree ASIC vision processor for L3/L4 autonomous vehicles, currently under development with an unnamed partner, which is not Mobileye. ST will leverage a CMOS 28-nm FD-SOI technology for both new chips. In addition, ST is devising a new lidar ASIC, for which it is reusing the time of flight (ToF) concept it has already developed, supplied and proven in high-end smartphones. 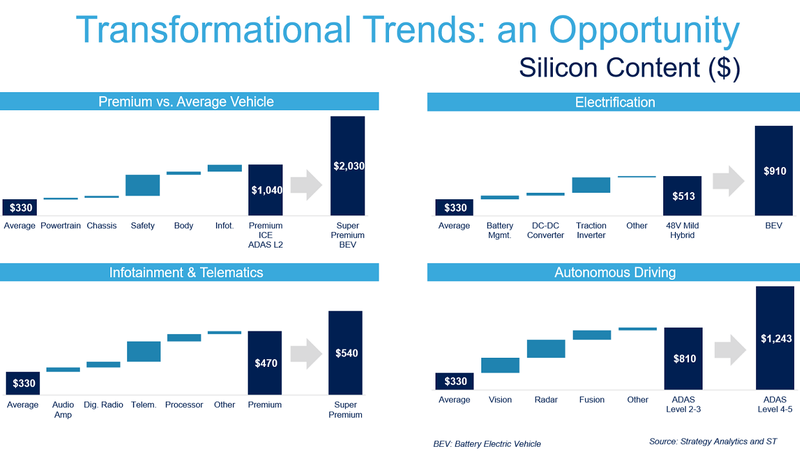 ST appears to be neither ignoring nor falling behind in the highly autonomous vehicle race. What’s different is that the Franco-Italian chip company is seeking to generate revenue by engaging in a much more diverse set of automotive segments. Last week, ST tipped off the company’s three new automotive chip projects under way, none of which has been formally announced. One is a new powerful ARM Cortex-R52-based engine control unit (ECU), consisting of six cores running at 400MHz. 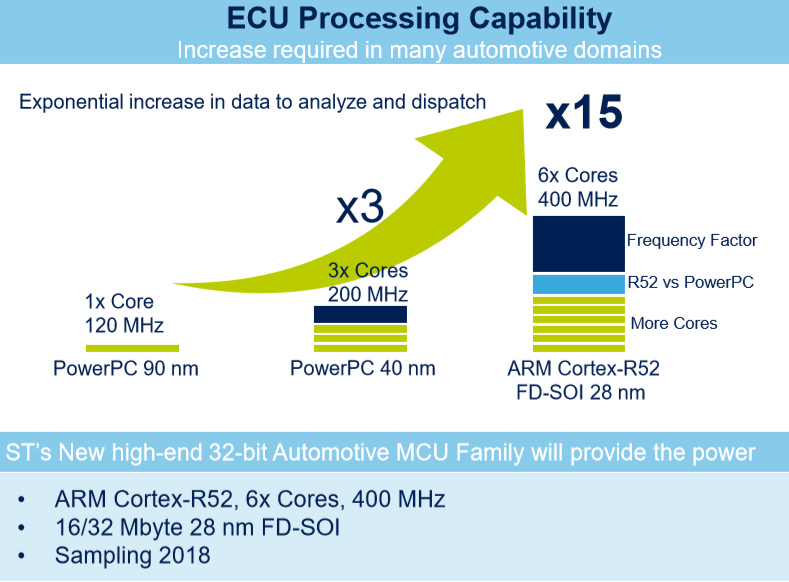 Designated “Stellar,” ST’s new ECUs will become a full-blown, scalable family of chips, designed to address “specifically the power train and safety roadmaps,” according to Monti. Scheduled for sampling this year, the new ECU will be fabricated by using 28nm FD-SOI process technology. ST aims to increase its processing power 15 times compared to ST’s Power Architecture-based 32-bit automotive MCU (three cores, running at 200MHz using 40nm process technology). Asked about the competitive advantage of the new ECU, Monti pointed to multiple factors. First, ST claims it has optimized both its architecture for the internal network connecting the cores, and its peripherals. Further, Monti added that ST is using its “own unique 28nm FD-SOI technology that integrates a new flash cell (phase change memory)” of 16/32 Mbyte.